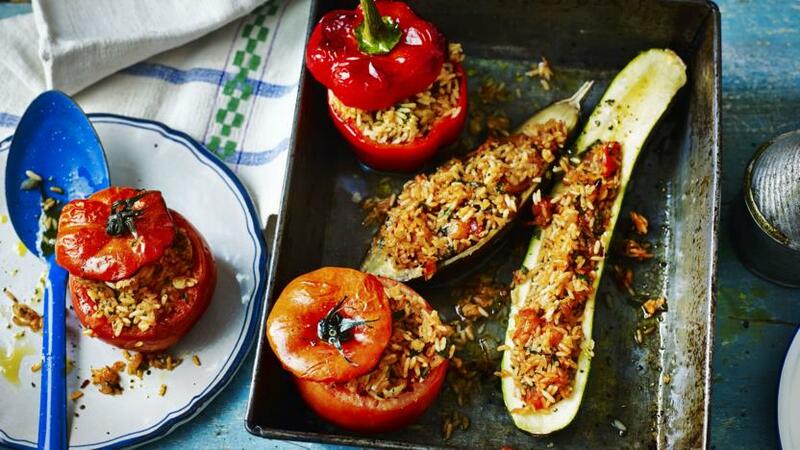 When we were filming in Greece, stuffed vegetables was our favourite dish. It all stemmed from a brief lunch stop at the little fishing village of Astakos, where we asked what was for lunch at the first quayside café we came to. They said stuffed tomatoes and peppers, which had just come out of the oven. Straight from the oven when you are ravenously hungry is perfect. This meal, if served as 10 portions, provides 249kcal, 5g protein, 39g carbohydrate (of which 6g sugars),	7.5g fat (of which 1.5g saturates), 4g fibre and 0.2g salt per portion.